One of the major influences on the history of the Chesterfield area was a family firm who have received little acclaim over the years but were the start of many local industries and added to the fortunes and misfortunes of the local people. The Smiths of Chesterfield. The family was for many generations involved in the cutlery trade in Grenoside Sheffield, starting with a yeoman farmer named William Smith. He died shortly after making his will in 1627 and carried on a business in the cutlery trade with a cutler's mark being granted to him earlier in 1614. The later generations carrying on the tradition in the cutlery business. One John Smith was apprenticed to a Master Cutler, John Winter whose daughter married John Smith. The family fortunes had started. John becoming Master Cutler in 1722 and was involved in the industrial fortunes of Sheffield throughout his lifetime. Instrumental in the construction of the canals of the South of Yorkshire and interestingly an involvement in the local Congregational Church in Sheffield. The last quarter of the eighteenth century saw the Smith family and friends expanding into other areas from Sheffield and two works were taken over at Brampton to produce iron castings for military use and for the production of Newcomen engines. This was an era of hostilities with wars between the British and the French, Spanish and Dutch in the American Wars of Independence from 1775 until 1783. And the Napoleonic Wars of 1799-1815. Cannon, cannon balls and musket shot were produced for the British Army and the East India Company throughout this period at the Brampton Griffin Works. The Smith enterprises also worked coal and ironstone in the locality with mines at Hollingwood, Staveley, Inkersall, Hady and Calow, with other ironworks at the Griffin Works Brampton, Calow Foundry and Stonegravels Ironworks. This building known as Cannon Mill is one of the oldest industrial buildings in Chesterfield and District having been erected prior to 1788. It formed part of the Griffin Foundry of John and Ebenezer Smith and Company 1775-1833 and was restored in 1957. The Adelphi Ironworks was built around 1799 as a munitions factory capable of producing nine hundred tons of pig iron per annum from two furnaces. From the 1837 Tithe map of the Sutton estate local fields reflect the use of the fields around the ironworks. Furnace field and brickyard field. 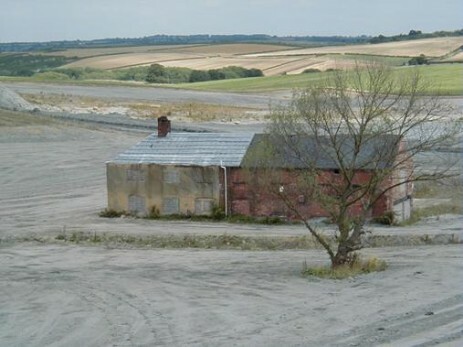 The site of the two furnaces being in furnace field, and of course brickyard field housed a brickyard, with clay pits and ovens being used to produce building materials for housing and mine support. Ebenezer Smith 1756-1827, (Quoted as being an Iron master in local trade directories of the nineteenth century) and his family ran the local iron and coal industry. The name Adelphi originates from the word delph, this being a corruption of an Anglo-Saxon word Daelph meaning to dig. The workforce was predominantly Cornish and was introduced into the area possibly due to a shortage of work in the Cornish tin and copper mines and a lack of mining expertise in the Duckmanton area. The East India Company having a vested interest in both tin and iron by exporting tin-plated iron wares around the world. Mr. Smith was educated in London as a 'Nonconformist' minister and was the assistant of Doctor Gifford at Eagle Street. He gave up the assistants post to concentrate on the family business but was instrumental in the setting up of the local Congregationalist movement as it progressed from the Oxpasture corn chamber on the works to the White Hart public house at Calow and then to the present site on Top Road at Calow. The works were run by Benjamin Smith and his cousin Samual Smith with John Charleton of Calow in charge of mining operations. John Farey writing in 1811 said of Charleton, 'a very ingenious mechanic, collier and iron smelter'. On the 10th. April 1802 John Charleton invented and patented cast iron puncheons or stanchions and caps for mine roof support. Which by being fluted and braced were both strong and light. However, miners resented their use and when they were introduced into the Butterley company mines in the 1920's their use was met with a threatened strike because they did not emit a cracking sound when the weight came on them warning of imminent roof collapse, unlike timber roof supports did. It is known from early records that coal and iron stone were mined on and around the Sutton estates; it would appear that the Romans may have worked an area at Calow in Allpits Plantation. Another document which is a grant dated 1451 from John Stanley and Robert his son to John, the Abbot of Welbeck. Refers to a watercourse called 'le sought', running from a mine of sea coal belonging to the Abbot in 'Dugmanton' through and under the lands of John and Robert as far as 'Reynaldsbrigge'. The bridge that carries Tom Lane over the Poolsbrook. The two Leeke families of Sutton Hall and Hasland Hall worked coal on their respective estates in the seventeenth century. The extent of mining operations is unknown because no plans survive; however it is known that coal was mined from early bell pits around Bower Plantation and elsewhere in the Adelphi Ironworks catchment area. Eleven coal and iron stone seams surface in a near north to south line running parallel to each other on the Sutton estate and the Smith's were able to exploit this in their operations. George Booker, who was coal and iron agent for the Smith's at Boythorpe Colliery surveyed the area and charted the strata basset edges caused by the Brimington Anticline. This uplift in the strata which caused this phenomenon and aided the extraction of the minerals required on site. The ironworks were set up in an area which for centuries had supported small coal and ironstone mining operations for the use on the Sutton and surround estates. No records survive as to the uses of the minerals but one can postulate that the large houses in the area would at times have burnt coal on their fires, although coal was not a popular fuel until wood was in short supply. The local Hearth Tax Assessments of 1662-70 support thirty nine hearths in Calow and one hundred and thirty one in the Sutton and Duckmanton area some of which were blacksmiths supplying iron for the farms and estates. One can also support the fact that iron was imported to the area, the Attercliffe group of ironmasters selling iron to the Bolsover area from 1690-9. Did any of this iron end up here? The coal seams that surface were worked by around twenty shafts in the area and early Ordnance Survey maps show a tramway connecting mining operations in Westwood to the ironworks with another tramway running from alongside the main road across from the Duckmanton Common coal pits on the site of the old Arkwright Town and on to the ironworks. In 1842 a government report stated that Benjamin Smith and Company worked three coal and twenty ironstone shafts. The shafts were shallow by today's standards but in their day they would have used the latest technology in shaft sinking and operation. One such shaft was sunk in 1815 and became known as the Waterloo pit to commemorate the famous battle. The Duckmanton Ironworks pits comprising of around five shafts were sunk from 1826-1835 and exploited the First Saint Johns seam at one hundred feet from the surface, the Second Saint Johns seam at one hundred and twenty seven feet and the Top Hards seam at three hundred and nineteen feet deep. A lease was arranged with the Duke of Devonshire to mine coal in the Staveley Upperground colliery which was in operation from around the turn of the nineteenth century until 1842. Other collieries (Tom Lane or Duckmanton colliery) were worked at Tom Lane until 1851. Higher up the valley towards Calow on the site of Lodge Farm was a colliery which worked two shafts into the Deep Soft or Main Soft seam and the Pinder Park ironstone rake with Deep End colliery on the Moor Farm site belonging to Benjamin Smith and this was abandoned in about 1859. Coal was also mined at Hady Colliery but may have supplied the Calow ironworks and later the Griffin Works in Chesterfield. The shafts were all brick lined using locally manufactured bricks and one such shaft employed an idea from Cornish tin mining to allow men to ascend and descend the mine. The shaft had a series of insets in it large enough to house a man and the installation of a Cornish type beam pumping engine on the surface allowed men to ride in and out by riding on the cross stays of the pump rod. As the rod raised the men rose with it, as the rod became stationary the men got off into the refuge holes and waited until the next upwards motion to rise further up the shaft. So after many 'ons and offs' the shaft could be traversed. Ventilation at the time of the Smiths mining operations would have been by a furnace in the return or upcast airway, which was created originally by splitting the shaft into two using a brattice frame. The system of ventilation here would suggest that separate shafts for upcast and downcast air were employed. A disaster happened at Hartley colliery in Northumberland in 1862 when only one shaft was used at the mine. The heavy wooden headstocks fell down the shaft entombing two hundred and four miners who later died being unable to get out of the mine. The later act of Parliament prohibited the use of a single shaft and at least two means of access were to be available to every mine so it would appear from the use of double shafting on the Smith collieries that they were ahead of the times in some ways. The rusty-coloured ironstone which was mined locally comprised of only thirty percent iron when smelted, it came in several shapes; balls, nodules, dogs tooth and so on referring to its physical shape. It occurs as 'Siderite' or iron carbonate and several seams or 'rakes' occur between the main coal seams. A survey document from a competitor of the Smith family enterprises, the Barrow family (later to become the Staveley Company) shows that the Inkersall Rake ironstone was being mined in the Duckmanton and Staveley areas at a rate of 1,932 tons per acre. (24th. March 1840). From the inventory of factory produced wares it would seem that the particular form of iron produced could not or was not made into steel because the iron produced had a high phosphorous content. It was used mainly for forging and casting of large industrial machinery parts for lead and coal mining operations as well as for use in the munitions industry. The Adelphi iron was used on large castings and in 1831 a casting of seven tons was produced at the works for the upper part of a Dakeynes patent hydraulic or water turbine engine. The inventors, the Dakeynes brothers were flax millers from Darley Dale and the engine was being produced for Thomas Bateman of Middleton who was the agent at the Mandale lead mine and John Alsop of Lea. It was described in the Mechanics Magazine of 1833 as being difficult to operate and as for the inventors specifications these were brushed off as a 'perfect smother of outlandish jargon'. The pump was used for raising water out of a lead mine near Alport and it was claimed to be able to produce one hundred and thirty horse power with a sixty feet vertical fall of water by producing a pressure of 25.5 pounds per square inch giving it a rotary motion and therefore being able to pump water. In September 1836 the foundry produced a fifty two foot diameter water wheel capable of pumping around four thousand gallons of water per minute from a depth of twenty fathoms (one hundred and twenty feet) for which it was paid £537 by a lead mining company. Another wheel this time a smaller thirty five foot diameter one was installed further down the valley in 1840 at the Mandale mine, pumping water from underground, ninety foot below the level of the river Lathkil. The above figures show that the works were still in use after the Smiths had departed in 1845 but over the years the usage of the land had changed from iron working and coal mining to estate work and coal mining. No records exist prior to 1841 as this was the first ever census in modern times in England and continued every ten years after. To show the amount of raw materials required at the furnace we must first look at the amount of pig iron claimed to have been produced at the works. The works were claimed to be capable of producing nine hundred tons of pig iron per annum from the two blast furnaces on site from the first blow of the furnaces on February 15th. 1803. As the ironstone yielded only one third of its weight in iron then nine hundred tons of pig iron needed twenty seven hundred tons of ore. Prior to 1828 and James Neilsons invention which allowed preheated air into the furnace it took eight tons of coke to produce one ton of iron, his invention enabled a reduction from eight tons to five tons to take place. It also took 1.33 tons of coal to produce a ton of coke all mined locally. Please note that these figures are a rough estimate and based on certain assumptions. One contradictory note is a letter from Ebenezer Smith dated 1806 claiming to be able to use only six tons of coke to produce one ton of pig iron. The need to transport large castings throughout the county was a cause of major concern to the Smiths. It was normal for a manufacturing industry to concentrate on production throughout the winter months when the unsurfaced roads would in most places be bogged down because of the wet weather. Then in the dry summer months transport the materials produced during the winter. The main road into the works was from Calow down the side of the Smith residence at Duckmanton Lodge and past the toll house along the lane. This lane by virtue of its incline must have presented several problems to the carters. Another two roads were constructed one from Duckmanton Moor and another from the Inkersall Road to the works. In 1799 a canal was constructed utilising the unwanted mine water pumped out by the Watt modified Newcommen steam pumping engine from the underground workings and a brook was dammed and the water stored in ponds to also provide water for the works. The canal ran from the works following the line of the brook and to Tom Lane colliery where the barges would have been off loaded and taken by road to the Chesterfield Canal at Staveley. Smith’s canal was only half a mile in length and was carried in a wooden trough. The barges carried one and a half tons of materials in corves or boxes. Traffic was two way, finished goods to the end and coal and ironstone back to the works on the return journey. Due to the problems encountered with the transportation and the short length of the finished canal did the Smiths want to utilise the Poolsbrook as a natural canal to transport their materials onto the Chesterfield canal with a longer Adelphi canal? It is said that the works ran into difficulties in the middle of the nineteenth century, what is known is that as early as 1821 from a letter dated March 5th. John Charleton and the Smiths were accused of illegally taking coal from 'the Liberty of Staveley Upperground colliery, from the Old Level' which borders onto the Arkwright estates. This they denied claiming that they had previously been given permission to mine here by the Duke of Devonshire’s former land agent. Another letter (L). Dated 23rd. March 1832 reported that the lease of 12th. October 1819 between the Duke of Devonshire and the Smith Company for mining the Staveley Upperground colliery and the Hady ironstone mines had been cancelled. Smith and company were ordered to pay compensation of £752. & 7shillings, this being the outstanding amount between the valuation of the Staveley Upperground colliery assets on entry and exit and rent arrears. The colliery was taken over and further developed by Barrows Company until abandonment in 1842. In 1845 Benjamin Smith and his son Josiah Timmis Smith sold the iron works at Duckmanton after running it with mixed fortunes for around twenty five years. They purchased the run down Stanton iron works at Ilkeston and took on new mineral leases from Earl Stanhope for ironstone, coal and fireclay and proceeded to build new furnaces on site. It would appear that this was a more financially viable transaction than to invest in the Adelphi works. By 1849 Benjamin Smith and Company were declared bankrupt (13th November) at the Stanton ironworks owing some £60,000 and their affairs were taken over by their two Glasgow banks the Western and the Commercial. The works being taken over later as a going concern by Crompton and Company, a creditor, in 1855 when all the legalities and finances had been sorted out by the companies lawyers. The Adelphi meantime was struggling to survive; both furnaces were out of blast by 1848. The leases of coal and ironstone were put up for auction along with the colliery, ironstone and iron making plant and steam engines. Several small companies took over the mining leases to mine the coal reserves. The firm Coke Turner and company of 26. Low Pavement Nottingham worked the Blackshale coal and some ironstone mines on the estate from around 1851-1873. The Barrows who for so long had thwarted any expansion of the Smiths were turned into a limited company in 1863 and as the Staveley Company they pressured the Arkwright's for the lease of the mineral rights of the Sutton estates. Robert Arkwright was trying to find a solution to the problems of the works. From 1848-1849 several letters went back and forth between Robert Arkwright’s mineral agent Mr.Currey and the Hardwick estates manager Mr.Cottingham and the Duke of Devonshire over the proposed construction of a railway from the Sutton estates and over the Dukes estates to Staveley but due to the pressures laid to bear by the Barrows the line was never constructed for the Arkwright’s. It appears that the Barrows were concerned about their competitors having way leave over land which they were leasing from the Duke of Devonshire. Mr. Arkwright offering Mr. Barrow the use of the proposed railway from the Speedwell colliery and Staveley ironworks for an annual rent of £500 or 3d per ton on the carriage of coal. Each time proposals were made they were rejected by either the Duke or Barrow. These negotiations raise two interesting points: firstly, did the Smiths indeed apply to the Duke on an earlier occasion for way leave over his land to use the Poolsbrook as an extension of their canal? And secondly, were the problems encountered with the negotiations the reason for the later Lancashire, Derbyshire and East Coast Railway under Arkwright’s guidance choosing the route onto the Sutton estates that it did? William Arkwright finally relented on the sale of some of the mineral leases of his estates to the Staveley Coal and Iron company in 1880, the sixty three year lease for five thousand acres of coal led to the creation of the large collieries of the company at Markham Number One colliery (1880), Markham Number Two colliery (1886) and Bonds Main (1895-8). These collieries were sunk into the rich Top Hards seam, known elsewhere as the Barnsley Bed, in areas near to but not touched by the Adelphi mines, one shaft at the Adelphi being used until the closure of Markham to pump water onto the washery plant at the colliery. The ironworks were by now used by the Sutton estates for farming and repair of carts and other equipment used in the every day running of a country estate with the buildings being used to house families. Most inhabitants moving into new accommodation with the building of Arkwright Town by the Staveley Company to house the workers at their mines at Markham and Bonds Main at the turn of the century. 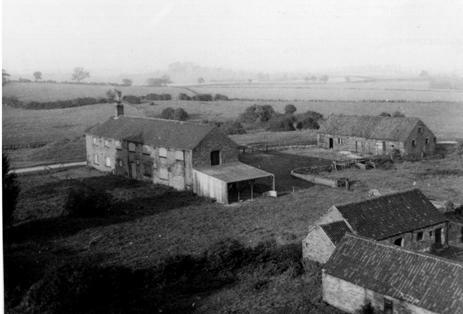 The later sale of the Sutton estates in 1919 saw the ironworks as a farm and farm land which did keep some of its industrial ties by being named Works Farm, a memorial to times past. Duckmanton Ironworks Pit sunk 1826-1835 along with four shafts sunk at earlier dates. Staveley Lowerground Colliery and ran towards Staveley. The two main roads running parallel to each other. The colliery was superseded by the Speedwell Colliery, which was planned in 1837. Tom Lane or Duckmanton Colliery was mined in association with the ironworks and Richard Arkwright (jnr's) mineral plans show abandonment of some of the colliery workings to be March 25th. 1843. The colliery had three shafts two of which were one hundred and thirty yards deep into the Top Hards seam, a third and possibly earlier shaft is also on the colliery site. Other dates show abandonment of workings to be 1847 and 1851 respectively. Two shafts worked the Deep Soft or Main Soft coal seam and the Pinder Park ironstone rake near to Lodge Farm and two more shafts belonging to Deep End Colliery mined the same seams in an area near to Moor Farm, the colliery was abandoned in 1859. 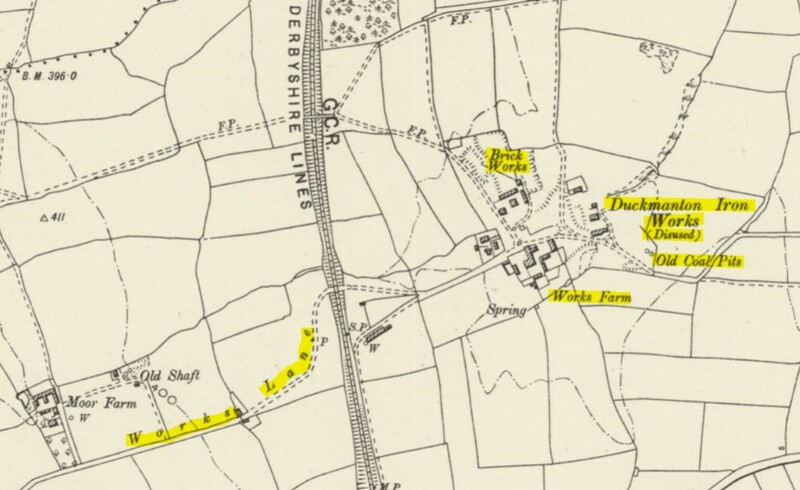 Duckmanton Common Coal Pits are shown on very early Ordnance Survey maps of the area surveyed prior to 1840 on the site of the Old Arkwright Town. The pits were abandoned between 1824 and 1847. Other collieries have worked the seams under the area from most directions in the late nineteenth to the late twentieth centuries.